This is a photo I took last November while wandering along a dirt road in far northeastern Yellowstone County. The view, inadequately captured here, was another reminder to me of the beauty of our prairies, and the vastness of our sky. 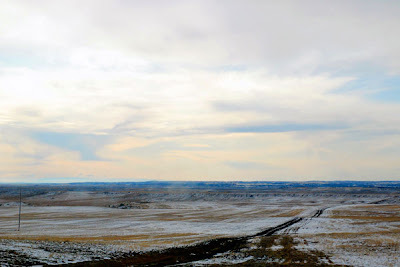 The best prairie pictures I've seen have been panorama photos, the endlessness is more evident for some reason. I get frustrated trying to take prairie pictures, because I can't capture depth AND breadth....perhaps because it's just that subtle on the prairie. Of course I love this shot. The sky even looks cold! Yep, I think it's much harder to get an evocative, representative shot of our part of the world ... the wonderful sense of vastness is really difficult to capture in a camera lens. But it's fun to try!